A boy, new to the neighborhood, falls for the older girl next door is this wonderfully expressive Dutch student animation. A supremely lovely student animation, I posted this to the ol’ Twitter and Facebook yesterday, but it needs to be on the site too. 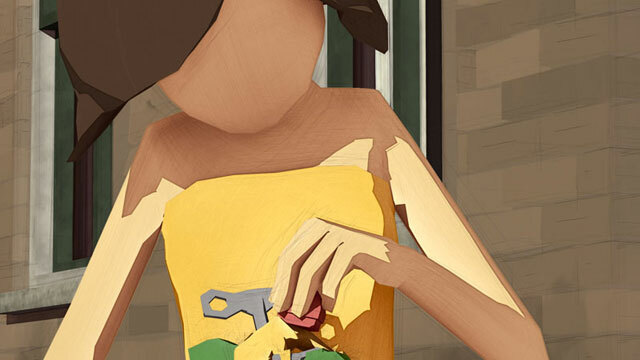 We’re familiar with films sans dialogue, but Blik‘s characters are without faces too! Even then, this story of a boy, new to the neighborhood and who falls for the older girl next door, manages to be one of the most wonderfully expressive short animations to come around in a while. A lot of the attention will go to the 3-D modeling and coloring, which is life-like, yet unnaturally vibrant. Light in the film is used in complicated ways to create lovely shadows tooI’d be curious to know if the team shot reference video. Yet as lovely as such design details are, I’m drawn back to the character animation which expresses the emotion of the film very subtly, not giving in to cartoonish antics. Bastiaan Schravendeel directs a team from the Utrecht School of the Arts in the Netherlands, and together they are creating work under the label of Polder Animation. Polder is off to a great start, having played Annecy with this film, as well as having their next film already completed. A brief 2min33 short, it debuts August 3rd in Dutch theaters as a precursor to screenings of The Smurfs. Hopefully Polder Animation’s new fans from around the world will get a chance to see it as well.